My 3 year old little girl LOVES to dress up like a princess with her pretend gown and plastic high heeled shoes. She even has a wand that she waves around. Here is an adorable picture of my cuties all dressed up. I made my son’s prince hat out of copy paper and took an old curtain and made a cape. They were so happy. 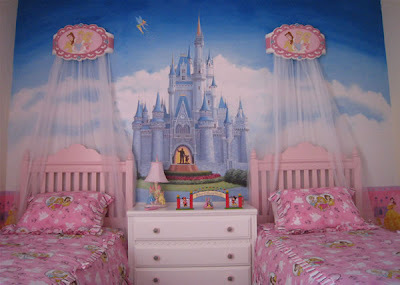 To start, here is a picture that I found of a beautiful princess room. What makes this space is the fancy custom made drapery with matching tie backs. The focal point though is the fancy lace above the crib. What little girl wouldn’t want a room so wonderful? 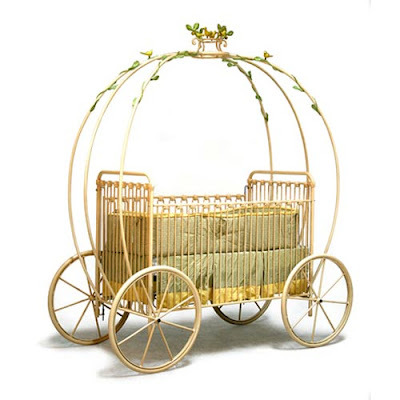 How about a crib that looks just like Cinderella’s stage coach? How cute is that? I know that this next one, isn’t a nursery, but I thought it was too cute to not share. 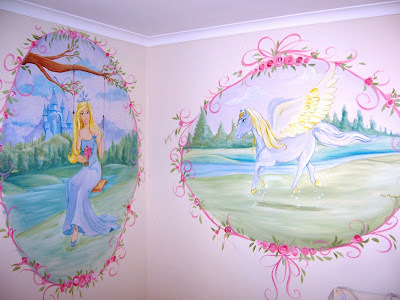 You can go in many different directions when planning a princess themed mural. 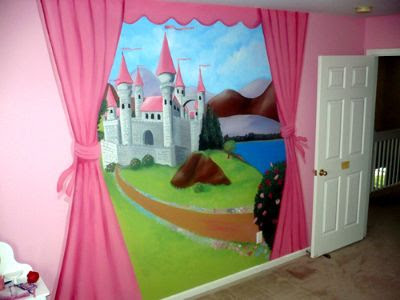 I think the best way to bring the fantasy world into a little girl’s bedroom, is through a handpainted wall mural. It really doesn’t need to be anything fancy. Even if it is a simple landscape with a castle off in the distance, that would be the perfect backdrop. You can bring in other elements such as rich girl window treatments, princess bedding, and draped fabric above the bed. Here are a few princess themed nursery accessories that may help you add to the decor of the room. 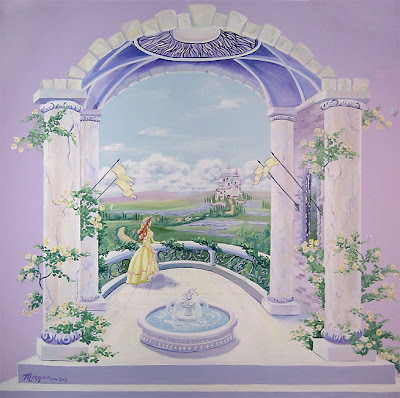 I was visiting your painting biz page – do u have to paint a mural by visiting your customer? I was wondering what you offer for murals or other decoration ideas of painting because we may be doing an addition this spring and if we can afford to do the addition I want to decorate my daughters room all girly for her!